Malaria remains a major public health issue in Burkina Faso and is endemic throughout the country. Eighty percent of the estimated 19 million residents of Burkina Faso live in rural areas, where they are at greater risk for poverty and poorer health than their urban counterparts. In 2014, the proportion of children infected with malaria parasites in rural areas was three times that of children living urban areas. Malaria prevention and control activities are guided by a national malaria control strategy, which supports the long-term vision of eliminating malaria in Burkina Faso by 2030. The strategy includes support for vector control, seasonal malaria chemoprevention for children under five years of age, intermittent preventive treatment for pregnant women, case management, and behavior change communication. 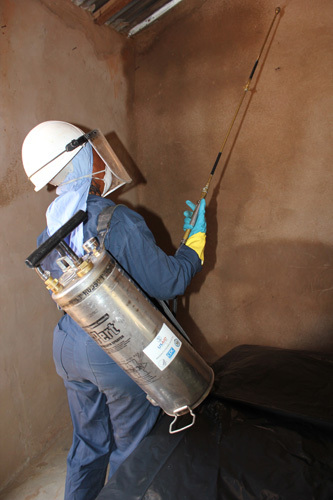 The PMI VectorLink Project in Burkina is working with the MOH, the NMCP, PMI, the Regional Health Directorate, the District Health Management Team (DHMT), and other stakeholders to achieve at least 85% spray coverage in the IRS targeted districts. Based on discussions with the NMCP and PMI, the PMI VectorLink Project will aim to cover 250,575 eligible structures in 2018, protecting an estimated 814,369 inhabitants in the three districts. Develop a national IRS training manual (adaptation to Burkina Faso guidelines).